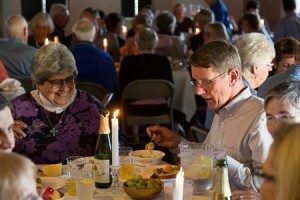 These events occur on an ongoing basis at Foothills. Book Club – Fourth Tuesday of each month at 10:30 a.m. to 11:30 a.m. in Fireside Room. Bridge Group – Second Saturday of each month at 1:00 p.m. in Choir Room. Experienced players but new players to the group are always welcome. 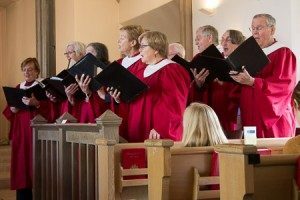 Chamber & Chancel Choirs – Wednesday rehearsals, see Music Schedule for time and Music for details. Rehearsals usually on Wednesdays at 7:30 p.m.
Circle of Women – Adult women’s Potluck Supper fourth Monday of each month 7:00 – 9:15 p.m. in the Meeting Room. Great way to meet others. Elementary Choir – Sunday rehearsals in the choir room from 11:15 to 11:45, September through May. For kindergarten through 5th grade. Handbell Choir – Wednesday rehearsals in the Meeting Room (Learning Center) and music fellowship. See Music Schedule for meeting time and Music for details. Hiking Group – Every Wednesday at 9:00 a.m. in the first parking lot at Hidden Villa. Knitting Circle – 3rd Thursday of the month at 1:30 pm in Fireside Room. Come learn with others. Check the calendar. Lectionary Bible Study – Tuesdays at 3 to 4:00 p.m. in the Redwood Room. Men’s Breakfast Group – Second Wednesday of each month from 7:30 to 9 a.m. Buy your own breakfast. Fellowship for men. Thursday Truth Seekers – Thursdays from 11 a.m. to 12:15 p.m. in the Meeting Room. See Faith Formation “For Adults” for more information. Women’s Fellowship – Second Tuesday of each month at Noon in Fireside Room, bring your lunch.